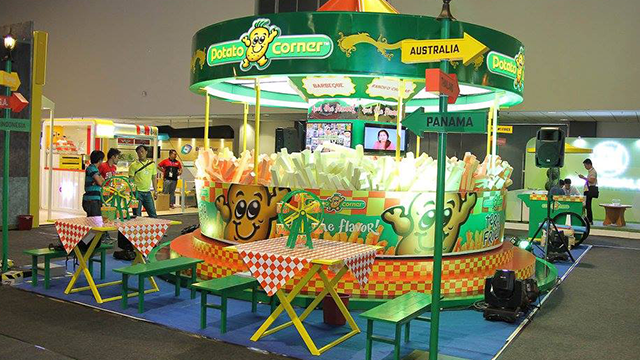 Potato Corner is one of the most successful food-cart franchises in the Philippines with over 650 outlets nationwide. Known for its flavored fries, Potato Corner has evolved from a well-loved homegrown brand to a fast rising global brand, with 150 outlets in Australia, United States, Indonesia, Panama and Thailand. Amidst all the success that the company is enjoying now, Potato Corner was once a struggling startup 24 years ago. The journey started as a business idea among friends to pioneer flavored French fries to the young consumer market. This idea soon became a reality when they launched their first kiosk outlet at SM Megamall in 1992. Growing a startup business is no easy task. It takes a lot of personal sacrifices and commitment to make the business succeed. It can also often be stressful because there are trial-and-errors along the way. You will have to manage all these while running the business to survive financially in the first few years. Potato Corner started with an initial capital of Php 150,000 which was used to put up its first kiosk outlet. Although business was doing well, there was no way for the company to grow faster because of capital constraints. Unlike today when startups can easily pitch for capital to organized groups of angel investors, the only capital available at that time for the company was from relatives and personal savings. One day, Jose Magsaysay, one of the key founders of Potato Corner, raised the idea of franchising the business, but the company has only one outlet and no clear track record to speak of. So, in order to make the deal attractive, Magsaysay came up with an innovative scheme to joint venture with investors by waiving the franchise fee. This way, total investment becomes cheaper as investors only need to shell out money for the food cart and working capital, not to mention the comfort of having the franchisor as partner. The franchise deal was so marketable that the company immediately franchised its second outlet the following year, and soon, within two years after launching, Potato Corner has already franchised a total of 70 outlets. The expansion enabled Potato Corner to achieve competitive cost advantage brought about by economies of scale from increased production. Lower costs meant higher margin from monthly deliveries of supplies by the company to its franchisees. Potato Corner as a brand, when it had only one outlet at that time, may not have meant so much way back then – but because of innovative franchising, the company was able to scale up rapidly by leveraging its business idea. During its early years, Potato Corner made the mistake of hiring the wrong people for certain jobs. According to Magsaysay, they simply hired people without checking their background. At that time, they did not know yet the kind of manpower they needed and what kind of people they should hire. They were not yet looking into the character and values of those early employees, and how appropriately they fit the positions and functions in the company. As a result of hiring mistakes, the company suffered from high turnover and pilferages. The company finally hired a human resource consultant later on, who helped them hire the right manpower for the job. Hiring people is always a risk. There is no guarantee that you will get the right one no matter how careful you are in selecting. Perhaps, when you have defined your standards and values for the job, you will be more prepared to find the right people. Startups do not enjoy the luxury of corporate structure where decisions go through several levels before getting approved. Decisions have to be made as soon as possible to avoid costly delays. When a startup involves several founders, it will be good to keep a flat organization and get someone to lead. This was how Potato Corner designed its organizational structure as a startup. Magsaysay was designated as chief executive officer of the company who attended to all the needs of the business. Efficient decision making helps move the business forward effectively. Potato Corner at one time tried to venture into other brands, which was outside of its core business. The company diversified into the restaurant business but failed. They ended up cutting their losses by selling and closing shops. “We sold and closed some investments because they did not fit our core values and conform to our business model. We realized that our strength is micro business, which is the food cart business. Micro business is our universe, where we have 24 years of experience in this field,” said Magsaysay. Having a clear sense of your core is an important starting point to plan your growth strategy. Identify your core business and strengthen it by expanding the opportunities to grow. Potato Corner has peaked at 120 outlets in 1997 when the Asian financial crisis happened. The years that followed have slowed down the economy with rising interest rates and the falling value of the peso. In 2001, the company has to close down several outlets due to operating losses, with only 40 outlets surviving. Despite the setback, the company thrived to succeed. It continued to promote the brand by winning awards and industry recognition. It continued to rebuild the lost outlets slowly and look for other opportunities for growth. In 2008, Potato Corner was able to recover more than what they have lost with 170 outlets by end of the year. This was also the year when the company branched out overseas for the first time with 10 outlets in Indonesia. The rest that followed, as they say, is history.